American Air Arms is the home of the Slayer Big Bore Bullpups and Rifles. 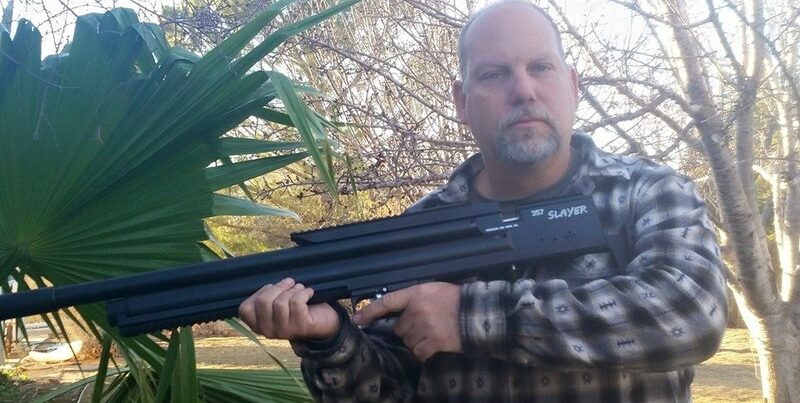 Founded by Tom Costan, an engineer, avid airgunner, and airgun hunter with a love of all shooting sports. American Air Arms PCP Airguns are completely and proudly made in the USA with nearly 100% American made materials! All parts (except barrels, grips and bolts) are engineered and manufactured in our own facility using state of the art CNC machining centers. In-house manufacturing allows American Air Arms complete control over the quality of our product! Our Airguns designs always start from a clean slate and are never just another example of the industry standard. They are engineered to meet a specific vision, purpose, and performance goals before any chips hit the shop floor. When the vision and purpose are clear, the performance goals are analyzed and found to be reasonable and attainable, only then can the actual design begin. This philosophy is what makes our guns lean, clean and gives them the exceptional effectiveness, performance and purpose they are known for. At American Air Arms, we define quality as: Excellence in engineering, reliability, precision, purpose and performance. Quality cannot be obtained without understanding the limitations of manufacturing with modern technology; every American Air Arms Airgun is a combination of vision and technology combined with passion for old world craftsmanship. An American Air Arms Airgun will exceed expectations, provide exceptional service, pride of ownership and one that will be shared with future generations.